Customer engagement is properly defined as: The extent of a customer's willingness to invest his/her discretionary time with a company for mutual benefit. 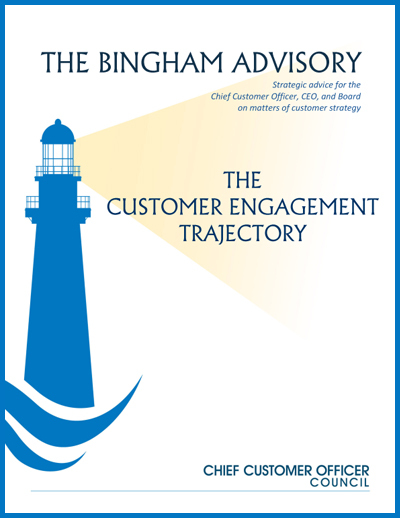 For a description of the measurement of customer engagement and a discussion of engagement's two key components, see The Bingham Advisory: The Customer Engagement Trajectory. Engagement is a more accurate measure of customer perception and is a leading indicator of loyalty. Loyalty is a subjective measure of an emotional state, whereas engagement is an objective measure of actual behavior. One of loyalty's greatest challenges is measurement of true loyalty. Loyalty is typically measured once or twice annually via survey. But surveys merely capture a snapshot of the customer's emotional well being at that moment. This snapshot could be adversely affected by factors outside the company's control. Survey granularity is often insufficient to discover crises in the making. In addition, customers are experiencing survey fatigue and response rates are falling, further masking potential crises from view. By contrast, engagement is based on observable behavior: is a customer participating in relevant activities that lead to purchase/renewal? By structuring metrics with sufficient granularity, a company can tell how often and to what degree a customer participates across a range of platforms and activities over time. Waning participation is a leading indicator that loyalty and future revenue may be at risk. Engagement is highly correlated with revenue. Oracle's most engaged customers generate 33% greater revenue. They are 4% more loyal and grant Oracle 12% greater share of wallet than transactional customers. PeopleMetrics found that companies focusing on customer engagement realize a 13% revenue reward, compared to a 36% revenue penalty for those companies obstructing customer engagement. *This article is excerpted from The Bingham Advisory: The Customer Engagement Trajectory, available for free download from the CCO Council website here.